QUAKETIPS: Are Command Picture Hanging Strips as good as maze picture hooks for quake-proof picture hanging? I’ve been experimenting recently with 3M's Command Picture Hanging Strips that are essentially a version of Velcro composed of two identical rows of interlocking plastic hooks, on those amazing now-you-stick-it-now-you-don’t adhesive strips that lose their adhesion when you pull the tab. They are nice because the picture is flush against the wall rather than hanging out at the top (see example photos below of more pictures in my home). They also have the advantage of not requiring any holes in the wall, a bonus for renters and for anyone who likes to keep their walls intact. These are extremely strong and advertise that four pairs of large strips will hold up a 16 lb picture. However, I presume this rating applies to vertical stability on stationary walls, so what would happen if the wall was shaking violently in an earthquake? First of all, here’s how the experiment was done. I wanted to come as close as I could to the actual situation of a picture hung on my wall. If these strips could fail, it could be where one half of the mutant Velcro meets its other half, or it could be where the whole assembly meets the picture or the wall. Therefore, I actually went to the hardware store, bought a real piece of drywall, painted it with a primer coat and then the same flat interior wall paint that I have on the walls of my home. Ok, how about a bigger picture. I tried the same framed picture that I used for the hook demonstrations above, although I had to remove the screw eyes and the picture wire from the back to allow the picture to lay flush against the wall, a requirement for the use of these Command strips. This one is about 2 lb; I used the medium strips again. I didn't make a video of this one, but after the ARMQUAKE, the picture had not moved. How about even large pictures? 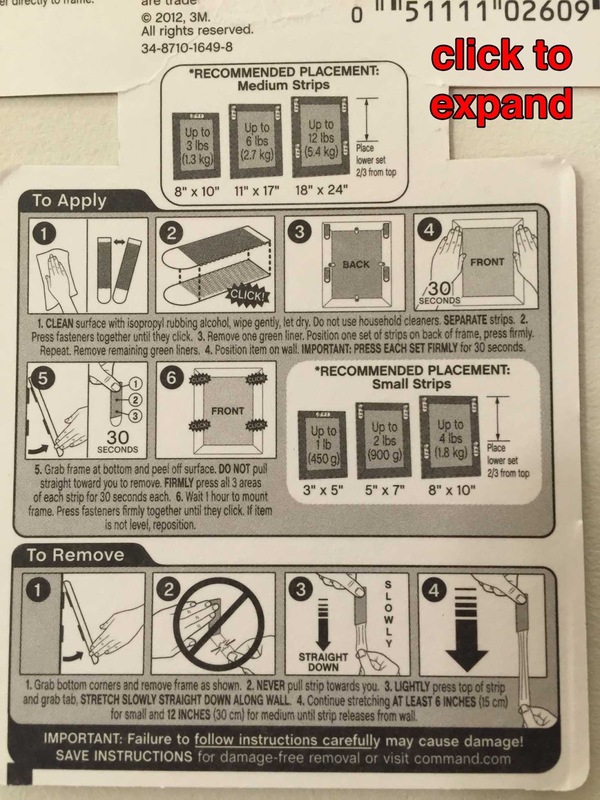 I would hesitate to hang giant or very heavy items with the Command Strips; that is not their intended purpose. If you have something heavy enough that you would have bolted a maze picture hook to a wall stud rather than nailing it into the drywall, you probably should not use these command strips for that object. However, let’s at least take it up another couple of pounds. I didn’t have a convenient heavier object to hang on the drywall, but I cleverly took this one step further because I DID have a heavier object to hang on the cutting board: the drywall! Yep, by holding and shaking the cutting board instead of the drywall, the ~5 lb drywall is effectively a picture hanging on the cutting board by the same Command Strips. I didn’t bother to make a video of this one, but after my big ARMQUAKE, the drywall was still stuck to the cutting board. So there you have it. I can’t guarantee that pictures hung with these Command strips won’t fall in an earthquake, and my testing is by no means exhaustive. I also did not shake the thing for minutes, just seconds, so it’s possible that extended shaking could dislodge them, although I think that is unlikely because the shaking did not loosen the attachments in the slightest. All I can really report is that, under some representative shaking conditions, these Command strips performed admirably. I also would not go by their recommended load limits for 4 pairs (up to 4 lbs. for small strips, 12 lbs. for medium strips, and 16 lb for large strips) because those rating assume no shaking. Instead, I suggest that people be very conservative; I’ve been using 4 medium strips for small light pictures in my home, and 4 large strips for the larger objects in my test (I hadn’t wanted to put up larger pictures until I ran these tests). 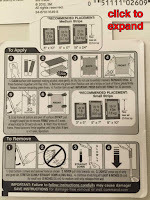 If you have a very large or heavy picture (no, I don’t know where to make the cut-off), and don’t feel confident that the Command strips will hold it, it’s probably still best to use the maze picture hook and possibly bolt it to a wall stud; you will have to assess the individual situation and use your judgment. If you use a maze hook, and want to stick the lower corners of the picture to the wall to stabilize it, I suggest cutting two small pieces of one of the many "gripper pad" products on the market and using those instead of quake putty (see photo at right for example); they are less likely to leave a mark on the paint years later (although I have not done a longterm test). 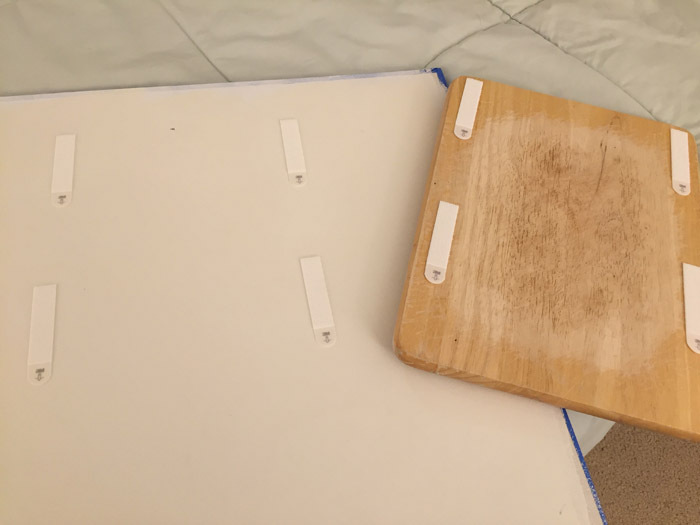 For a few extra tips on how to safely remove those strips from painted walls without damage, see my first note in the Comments section at the bottom of this article. I should mention that I have no financial interests in 3M or Command products (or maze picture hooks, putty, Gripeez, or cutting boards for that matter). PLEASE DON'T HANG PICTURES ON THE WALL ABOVE YOUR PILLOW, WITH THIS OR ANY OTHER TECHNIQUE. Nothing is foolproof. Well, that turned out to be a very useful exercise. And I even managed to invent the wall-mounted cutting board. Why would I want a wall-mounted cutting board, you ask? To chop walnuts, of course! 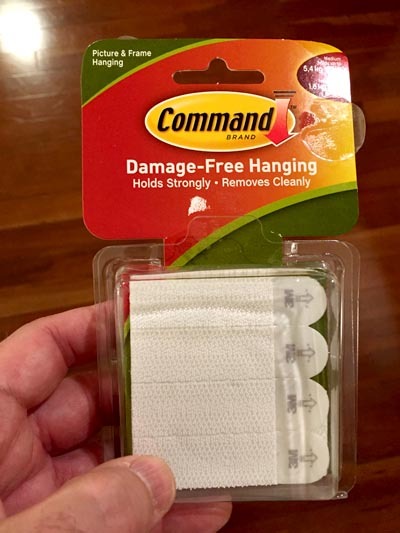 I should add that these Command strips are great at being removed without damaging paint, but there is a right way and a wrong way to remove them. As the instructions should point out, you want to pull the tab SLOWLY because it is losing adhesion bit by bit. If you pull the tab too quickly, the tab may just break off in your hand, forcing you to pull the tiny little bit that is left, not as easy. If you pull it gradually, like in my video showing me removing the strips, it will remain intact. You also do run a risk of pulling off paint if you pull it so fast that the adhesion hasn't been lost yet, especially if the wall turns out weak painted paper. And I don't think you are supposed to use these on actual wallpaper. Another tip is that you need to pull the tab parallel to the wall. If you pull out toward you at an angle, it will break. Just imitate what you see in my video showing the removal of the strips. You should be able to remove these years later without leaving a mark; I have done this on several occasions; although there have been occasional instances in which I had trouble removing the strip and a little paint came off; that has been rare and isn't much different from having to repair a nail hole anyway so you still come out ahead. One last note: this isn't much of a problem with these hanging strips, but if you ever use the regular Command strips to hang plastic hooks, etc., it's wise to have one hand holding that separate plastic piece because when enough adhesion is lost, that piece and shoot down at your tab-pulling hand and it's painful. This isn't a problem with these Velcro style strips because there is no other piece; the worst that can happen is that the rest of the strip slaps you tab-pulling hand as if someone had lightly slapped you on the wrist. Thank you! Helpful info and great demonstrations. I would like to add one more observation to my own article. I gave one of my talks the other day and mentioned that I was feeling pretty good about using these interlocking strips to hang pictures. Someone in the audience told me that she had used these to hang pictures a few years ago, and they were coming un-stuck. If I understood her correctly, it was not that the adhesive strips were coming off of the wall, but that the two interlocking halves were pulling away from each other. I was surprised to hear this, because in my experience, if you push the halves together firmly enough so that they completely lock in place, they cannot spontaneously separate on their own accord. It is actually rather hard to pull them apart. So I'm left wondering if perhaps the strips were not pushed together firmly in the first place; I have found that when pushing the picture against the wall, sometimes the forces are not distributed correctly and the two halves of the velcro-like hooks don't entirely engage each other. 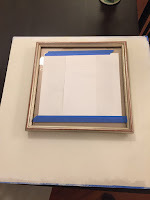 Alternatively, I have noticed that some frames are not perfectly flat in the back, and if you have the top corners and the bottom corners both stuck to the wall but the frame is slightly concave, then either the top or bottom strips will have pressure on them to pull away from the wall, and perhaps that was what happened. Still, without knowing more about this, I wanted to pass it along for transparency. I still feel that the strips I put up in my own home are in good shape; I check them from time to time, although it has only been half a year. One small object that I hung with those about 8 years ago is still securely fashioned, but it is light. Great simulation! I am thinking of hanging poster frames in my classroom and I saw the strips in Walmart. I think I will give the strips a shot. Thanks again!